Barely a week after declaring his wife Gurnam Kaur as his political heir, Nalagarh MLA Hari Narayan Saini died at a private hospital in Panchkula late last night following liver cancer and other serious ailments. 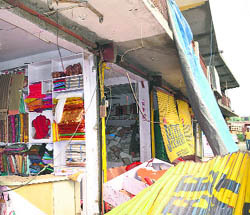 Two persons received minor injuries and more than six shops, besides the Punjab National Bank building, were damaged in a powerful explosion at Bhuntar, about 10 km from here today. Speed Post has lost speed. This observation was made by the High Court on the issue of delayed delivery of Speed Post article by the Postal Department. It has directed the Postmaster General to place on record as to how many complaints have been received regarding the delay in delivery of articles and the steps taken to ensure deliveries in expected time. The state-level Shoolini fair began here today, marking the advent of the three-day sojourn of the local deity Goddess Shoolini to her elder sister’s abode at the Mata Durga temple located in the Ganj Bazar here. With over 1,200 people losing their lives in road accidents every year in the state, the police has decided to keep a tab on habitual drunken drivers and offenders to enable punching of their driving licence and final cancellation through court directives. A team of the Vigilance and Anti-Corruption Bureau, led by additional SP Vimukt Ranjan and DSP Ramesh Sharma, today unearthed a major power theft in the Kala Amb area where a power connection issued to a welding shop was being used to run two brick kilns and a tubewell in the bordering area of Haryana. Dimple Kaushal and Isha Rathore, employees of the Postal Department, bagged the top positions in the letter sorting competition, organised by the department at the divisional and state-level. The State Vigilance and Anti-Corruption Bureau has busted a money collection racket in the name of jobs being run by Murarilal of Gohar in connivance with a cyber café owner Vinod Kumar of Mandi. BJP workers of the Nadaun block today took some party leaders to task for ignoring some workers. They gave vent to their grievances before IPH Minister Ravinder Ravi and state vice-president Kirpal Parmar during the two-day Prashasan Janta Ke Dwar programme. The police today booked Kulwant Singh of Jonta village for allegedly attacking his 80-year-old father with sticks. Under the state government sponsored “Prashasan Janta Ke Darbar” programme, a camp was organised by the local Sub-Divisional Magistrate, Sushil Sharma, at Kangreri, a remote village in Indora tehsil on Friday. An additional assistant engineer and a primary school teacher died in two separate accidents in the district during the past 24 hours. A pall of gloom descended on the constituency as people heard the news of his demise. His body will be brought here tomorrow morning and he will be cremated at his native village Rajpura at 11 am tomorrow, revealed family sources. Born on January 18, 1952, to Ram Saran at Rajpura village in Nalagarh, Saini was known for his audacious, assertive style and simplicity. Eldest of the five brothers, Saini hailed from a rural agrarian background and was committed to the development of his constituency. He had designed and fabricated a drilling machine to solve the problem of irrigation. Saini, however, died a sad man as his differences with the Chief Minister, after the latter refused to induct him in the Cabinet, had left an indelible imprint of sadness in his mind. What upset him more was the slow pace of works in his constituency. Despite his illness, he pursued the progress of various works. Barely a week ago, he publicly announced that he had no personal differences with the CM and it was the slow pace of work which had irked him. He contested his first election for the post of pradhan and BDC member from the Rajpura ward but surrendered the former after winning both posts in 1990. 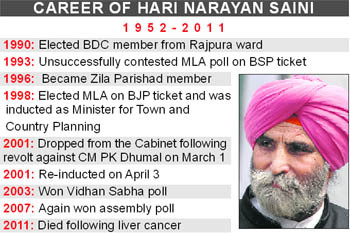 He contested his first Vidhan Sabha poll in 1993 on a BSP ticket. Later, he joined the BJP and won three consecutive MLA polls from Nalagarh in 1998, 2003 and 2007. Though he was inducted as a Minister for Town and Country Planning in 1998, he was dropped following a revolt against the CM on March 1, 2001. He was later re-inducted on April 3. Saini was moved by lack of facilities in the five panchayats of Malaun Pargana where unavailability of roads, hospitals and schools had made life troublesome for the people in the 1990s. In order to improve their lot, Saini spent lakhs from his pocket and got a bailey bridge constructed which linked this underdeveloped area to the rest of Nalagarh. He procured some funds from the development schemes while contributed the rest from his pocket. This was named “Hari Jhoola” and it was inaugurated by BJP senior leader Shanta Kumar. Various senior leaders, including Chief Minister PK Dhumal, Virbhardra Singh, Vidya Stokes, PCC president Kaul Singh Thakur, Health and Ayurveda Minister Rajiv Bindal, president, BJP Solan constituency, Ravinder Parihaar, vice-president Pawan Gupta, expressed condolence over his death. The BJP leaders said his death had created a void in the BJP and it was a big loss to the party. The impact was so high that windowpanes of most of the buildings within 50-metre radius were broken. Witnesses confirmed that the explosion spread panic while people started hiding themselves here and there. SP Abhishek Dular said the explosion took place due to the leakage of an LPG cylinder the whole night and the gas accumulated in the shop. Auto cut refrigerators in the shop might have ignited the LPG that caused the blast. He further said forensic experts from Gutkar reached the spot and confirmed that the explosion was due to the LPG cylinder and there was no sabotage. Asha, a morning walker, said the explosion that happened at 7 am could not be the cylinder blast as the cylinder was intact in the shop. Sandeep, a nearby resident, said the windowpanes of a gurdwara across the Beas were also damaged. The airport at Bhuntar is about 500 metres from the site of the explosion and an alert was sounded immediately after the accident. Most of the passengers on their way to the airport had to wait for more than 30 minutes at the explosion site. The DC, SP and many authorities immediately reached the spot. The SP said the initial investigations did not indicate any sabotage, however, the inquiry has been ordered. Taking a serious note of delayed delivery, the court also directed him to file an affidavit as to the efficiency of Speed Post. The court passed this order on a petition of Dev Kumar and Pushap Raj Sharma, who had applied to the HP Subordinate Services Selection Board, Hamirpur, for the post of Shastri (Sanskrit Language), but their applications were rejected as these were not delivered till the last date of submission of applications. The fair began with a traditional puja of Goddess Shoolini at the temple. It was attended by most people of the town. A large number of devotees turned up to seek the blessings of the deity. Later, a procession accompanying the bedecked palanquin of Maa Shoolini was taken out from the temple. It was received on the Old Court Road by Health and Ayurveda Minister Rajiv Bindal. The procession passed through various areas of the town. The fair culminates with the return of Maa Shoolini to her own abode located at the Shilli road. According to tradition, Maa Shoolini appears before the devotees fulfilling their wishes and, therefore, people from far and wide throng the town to seek her blessings. The fair, which started more than 100 years ago, has become a popular event in the district. Cultural festivities, which are part of the fair, were, however, cancelled following the demise of Nalagarh MLA HN Saini. A special meeting of the Shoolini Mela Committee was convened in the Deputy Commissioner’s office today, which was presided over by Rajeev Bindal. Dr Bindal lauded the contributions of Saini in undertaking various developmental activities in Nalagarh. He said Saini was the leader of masses, who worked for the socio-economic transformation of his constituency. The members of the committee paid their tributes to the departed soul. Among others, DC C Palrasu, Chairman Nagar Parishad Kul Rakesh Pant, vice-chairman Pawan Gupta, were also present on the occasion. of accidents by 40 per cent, it has also been decided to get the Asia Pacific Road Accident Data Base (APRADB) form filled so that the conviction rate improves through better investigation. The directives were issued today by DGP DS Manhas, following a presentation by Anurag Garg, IG (Vigilance) on improving road safety. “We are not empowered to cancel driving licences, but by maintaining a data base of habitual offenders we can punch these and later seek its revocation through the court,” says Manhas. “If we maintain our own police record we can seek the cancellation of the licences of people who are repeatedly found guilty of drunken driving or habitual offenders,” he says. He said the department would explore the possibility of starting punching of licences after seeking legal opinion. “Fines need to be revised so that they are prohibitive and people do not take them lightly,” Garg remarked. Despite there being a provision for cancellation of licence, this had not been done even in a single case even though in several cases it had been proved that the document was acquired from elsewhere. It came to light when the bureau officials raided the welding shop of Satinder Mohan and discovered an underground electricity network on the Tirlokpur Road to several metres in the bordering Haryana. As many as two brick kilns and a tubewell, besides power connections to about 12 huts, had been provided through this underground network in Naraingarh located 800 metres away. Investigations revealed that the power connection had been issued in 1999 and the power theft had been going on for 12 years. Since the rate of commercial power was in the range of Rs 7 to Rs 15 as against the rate of Rs 2.30 to Rs 5.70 per unit in Himachal Satinder had made use of cheaper power in Himachal to run his commercial ventures in Haryana. The DSP said a case of the Prevention of Corruption Act had been registered against officials of power board and a case under the Electricity Act had been registered against Satinder Mohan. They successfully performed the task of sorting 1,000 letters within the given time of 37 minutes and jointly bagged the first position at the divisional-level and won 2 gm of 24 carat gold. In the state-level competition, Dimple came first and won 5 gm of gold, while Isha finished second and won 3 gm of gold. The two winners said the speed of sorting depended upon the capacity to remember PIN codes. The more PIN codes one remembered, the faster the sorting could be done. The Chief Postmaster General, Himachal Circle, SC Jarodia, said the competition was introduced last year to encourage speedy and accurate sorting of letters, which was a key to efficient delivery of mail. He said sorting was difficult as 40 per cent of the letters either did not have a PIN code or had a wrong PIN code. Jarodia also formally launched the unique identification number registration scheme at the enrollment station of the General Post Office, here. He said there were 82 post offices in the state where enrollment stations would be established in a phased manner. The citizens would be required to furnish the proof of address and identification for registration. Even as the police has arrested the kingpin of the racket and recovered Rs 1.46 lakh from the accused, the complaints are pouring in from other parts of the state against them. A probe revealed that Murarilal and Vinod Kumar collected Rs 1,46,300 from victims. They had promised jobs in PNB to victims, Tek Singh, a resident of Dhalpur, Kullu, and two others from Pandoh and Bilaspur. Vinod used to prepare appointment letter stamped and signed by him as branch manager of ICICI Bank and PNB and Murarilal, who behaved as a bank clerk, used to issue letters to the individuals after they would deposit Rs 20,000 as fees for jobs. The Vigilance after arresting them raided tea stall owner Devi Ram at Bilaspur and recovered three fake stamps of the PNB and ICICI Bank. But he pleaded innocent as he told the police that Murarilal used to keep the stamps with him and did not know where he had used these, the Vigilance said.Vinod is in judicial custody for 14 days while Murarilal is in police remand till June 24. Vigilance SP Virender Sharma said it had received more complaints against the kingpin and was examining the computers seized from Vinod. Some party workers also raised issue of ignoring them while doing development works or making transfers of the government employees. The villagers submitted 57 complaints mostly related to scarcity of drinking water, the Public Works Department and office of the block development. Most of the complaints were redressed on the spot. The local farmers collectively raised their voice against the burgeoning monkey menace in the area and lamented over immense crop damage by them. Reports said engineer Balak Ram Sharma (54), employed at the PWD at Dholera here, was found dead in his Kotlu village well by members of his family yesterday. Sharma had gone to his fields to start tullu pump and fallen into the well. He was dead when his family members pulled him out. It is suspected that he got an electric shock from the pump and slipped into the well and was drowned. In another accident, Vasu Dev Sharma (49) of Mehran village near Ghumarwin, was killed when he slipped from a hill into a deep gorge. He was found by some students, but he was dead. He was employed at Government Primary School, Chalehali, near his village.